Can you believe the Red Sox open at home next week? It’s hard for me to wrap my head around this fact given that we still have a snow pile on our tiny front yard! But yes, it’s true, and, as a Boston lifer + Red Sox fan, I’m looking forward to working with the Red Sox this year as part of their Red Sox Moms program. A few weeks ago I met with the team that is working hard to make Fenway family-friendly, and I wanted to share 6 ways they're upping their game in that department. With the support of Hood, the Red Sox have a new program called Calling All Kids, in which kids can join Red Sox Kid Nation for free. 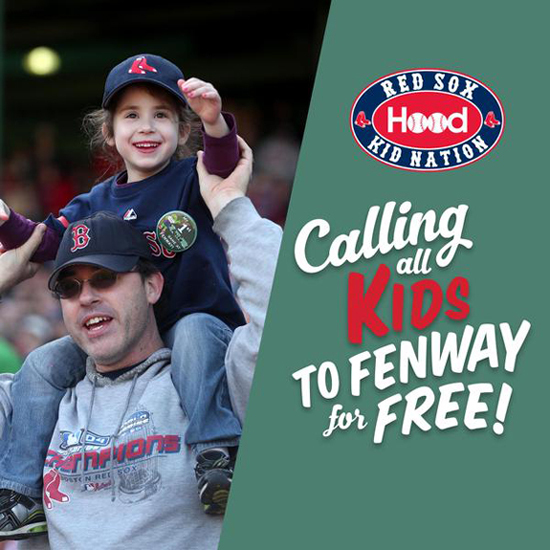 The first 25,000 kids registered for Red Sox Kid Nation will receive a free ticket to a 2015 game. And yes, you can of course make sure they line up with tickets you are purchasing. So go sign up! There’s a special new Fenway entrance just for families. Gate K is adjacent to Gate B, near the corner of Van Ness and Ipswich Streets. The Red Sox Kids Crew is a new dedicated staff for families; they'll greet kids as they enter Gate K, lead kids in games, and be on hand to help families at the park. Gate K leads families into the new Kid Nation Concourse, with activities (games, balloon artist, face painter, etc. ), kid-themed concessions, and more. Got older kids? As a longtime poor graduate student, I love that the Red Sox are making $9 home game tickets available for students 15 and older. Disclosure: The Red Sox Moms program is an experiential blogger program. I'm not paid to share information; I'm just sharing what I think is cool and useful for you all! Alcohol Consumption & Social Media: What Message Are You Sending to Your Kids?